Happy December everyone! And what a December it is going to be! There are innumerable television specials – most of which are happening on NBC. The NBC network is digging into some deep pockets this season to bring us some exciting holiday fare. First and foremost, with only two months left in Jay Leno’s contract, expect to see an exciting array of guests on The Tonight Show With Jay Leno during the months December and January. Jay has been slowly but methodically bringing back some of his favorite guests, such as last week’s appearance of Garth Brooks and Ellen DeGeneres a few weeks back. Which brings us to our seasonal shows. 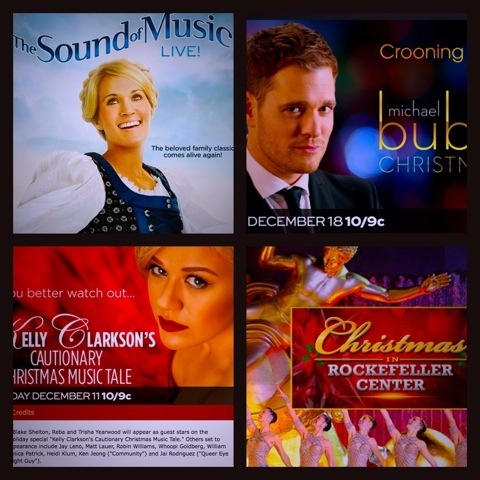 On Wednesday, December 11th at 10:00 PM, Jay makes an appearance on Kelly Clarkson’s Cautionary Christmas Music Tale. That is an intriguing title and it will be interesting to see now this show plays out. But, I, for one, cannot wait to see Kelly perform in the company of , Jay Leno, Blake Shelton, Reba, Trisha Yearwood, Matt Lauer, Robin Williams, Whoopi Goldberg, William Shatner, Danica Patrick, Heidi Klum, Ken Jeong (“Community”) and Jai Rodriguez (“Queer Eye for the Straight Guy”). However, before we see Kelly’s special, we have two biggies this week. On Wednesday, December 4th, my favorite Christmas special, Christmas In Rockefeller Center is set to ring in the Christmas season at 8:00 PM on NBC. Scheduled to appear are Mary J. Blige, Toni Braxton, Mariah Carey, Kelly Clarkson, Kenny “Babyface” Edmonds, Goo Goo Dolls, Ariana Grande and Jewel. Then, on Thursday, December 5th, the much anticipated live televised production of The Sound Of Music is set to entertain us beginning at 8:00 PM on NBC. Of course! Starring in the role of Maria is Carrie Underwood, supported by an exceptionally strong cast including Broadway star, Audra MacDonald. This is a huge coup for Carrie and, vocally, I am more than thrilled that she is using her spectacular voice beyond the confines of country music. She has much to offer the Broadway genre – her voice is perfect for this style of music. I am concerned about how strong her acting skills will fare but, hopefully, she has achieved wise and meticulous direction. And we cannot forget the National Tree Lighting Ceremony, featuring performances by Mariah Carey, The Avett Brothers, Grammy award-winning violinist Joshua Bell, acclaimed soprano and musical ambassador Renée Fleming, multicultural operatic trio Forte, Queen of Soul Aretha Franklin, singer/songwriter Janelle Monáe, Latin music superstar Prince Royce, jazz legend Arturo Sandoval, the multiplatinum, Grammy-winning band Train, and Nolan Williams, Jr. and Voices of Inspiration. The show will air on your local PBS station during the month of December. And that’s just a few of the offerings this holiday season. So, if you are out partying, make sure you set your DVRs now so you can watch all of your favorite shows at your leisure and still enjoy the company of family and friends during this joyous time of year. What did I miss? Which shows are your favorites? Please comment away! ‘Tis the season to come together! My question is this: How many of them even mention the Christ child, the Nativity, the real reason for Christmas? VERY FEW is my guess. So sad. Not even the saying of grace at a meal. I know that there are who say ‘what if we don’t believe in the Christ child. Why should we have that thrown in our face?’ I would ask this question: For very many people Christmas is about Christ. Why should He be totally ignored out of fear of offending those who don’t believe? We are offended because He is omitted. By the way don’t get me wrong – I enjoy most of the Christmas specials, the Made for TV movies. I just wish…. It doesn’t have to be all music or preachy. There were 2 tv shows – Doc and Sue Thomas, FBEye – that weren’t preachy but acknowledged God. And currently Blue Blood isn’t ashamed to say grace and then there’s Duck Dynasty which I will start watching very soon!!! watched the Christmas Tree Lighting at Rockefellar Centre last night. Thought it was lovely overall. Mariah sure puts everything she has into it and has an amazing ability, but I could do without so many vocal gymnastics, lol. Ariana Grande sure has a voice for such a little thing. Was something amiss with Toni Braxton’s voice? She seemed ‘held back’ by something. Maybe just trying to be subtle?